Your Coffee Machine and You! Love your cup of Coffee? But plagued with Coffee Machine choices? 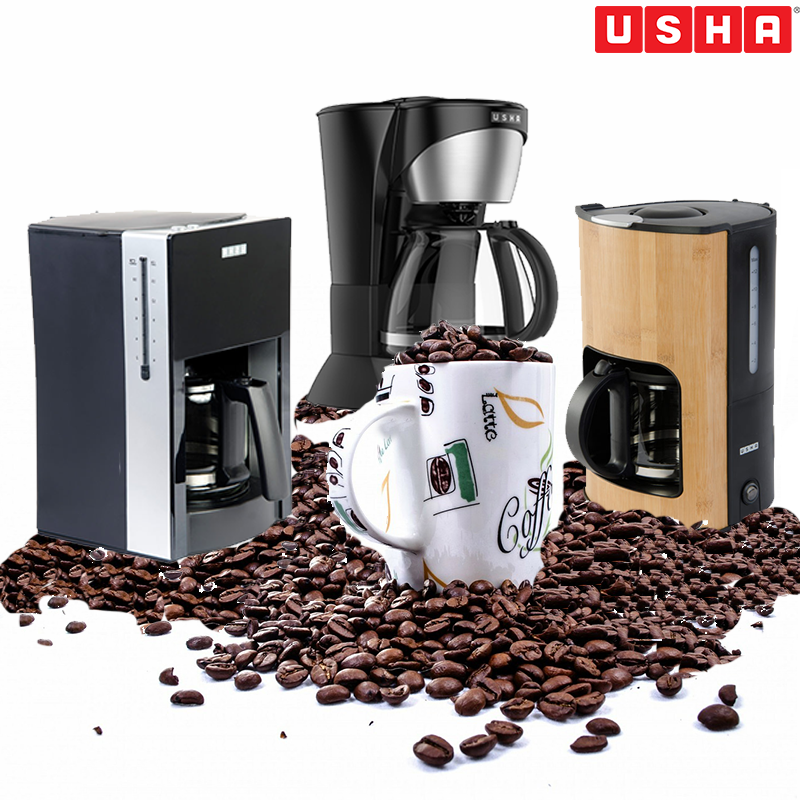 If you are looking for something efficient and stylish for your home, Usha Coffee Machines are the ones to go with. 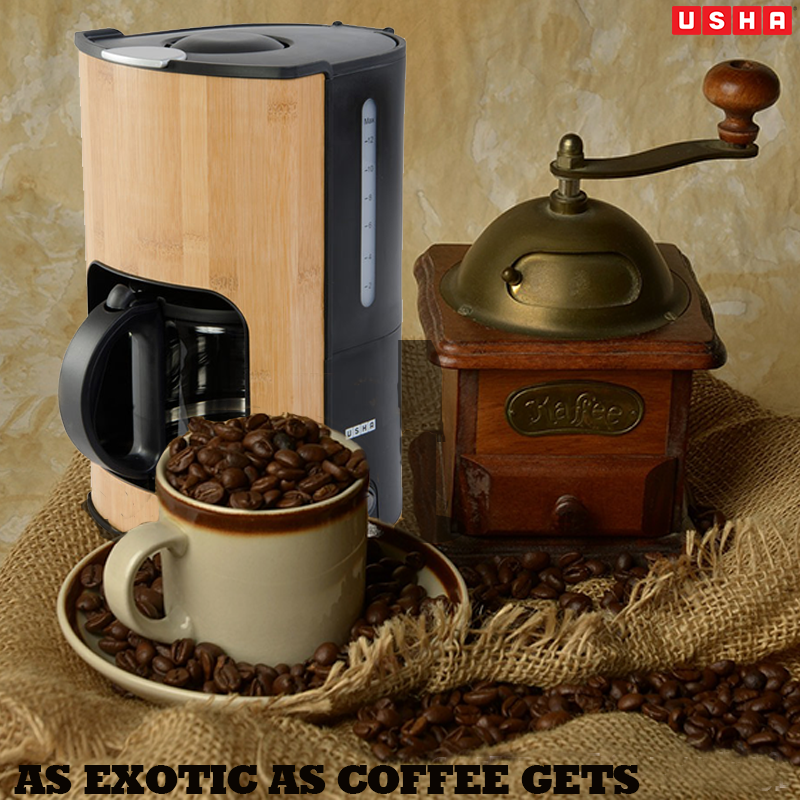 They are all aesthetically pleasing and efficient Coffee makers , with one of them even featuring a Bamboo finish! Also known as the dripolator, this machine houses a reservoir in the base which is called as the hose. These machines rose to fame in the 18th century, designed specifically to cater to the bold taste of espresso. The French Press was developed in the 1850’s. This is the oldest and the simplest of coffee making mechanism without the use of electricity. It comprises of a tall glass cylinder, a plunger and a filter. Pre-packaged coffee pods makes single cup. A coffee pod has coffee grounds and a miniature filter in the pack. 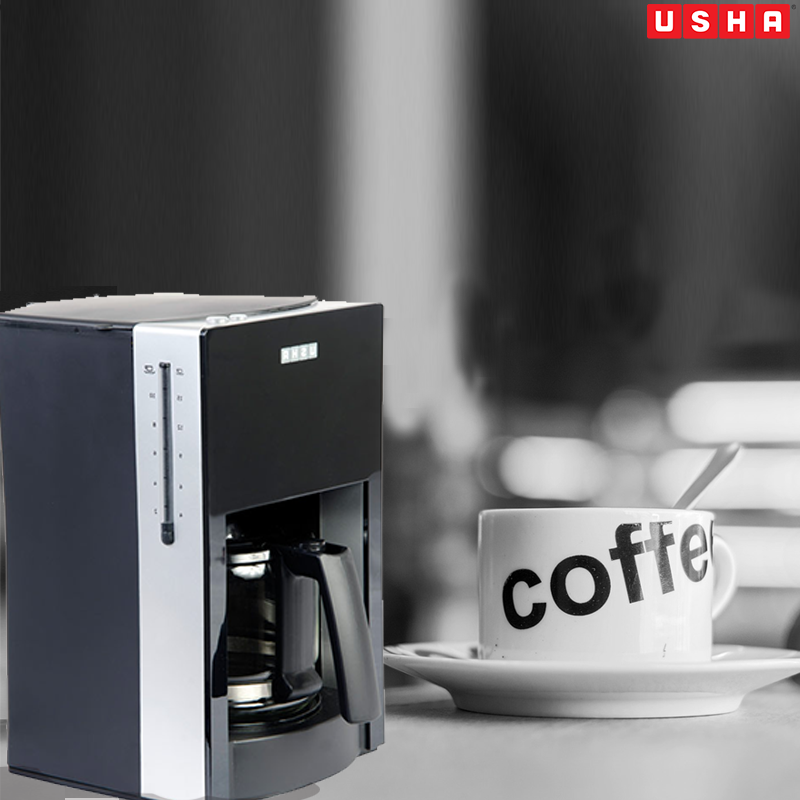 These makers are easy to clean and maintain and suitable for small households with few coffee lovers. Quick in operation they allow different users to suit their different tastes by using varying coffee flavours in the pods. Hot water is filtered through the coffee pod in the machine slot provided. The action results in a single cup of coffee. After oil, coffee is the most valuable legally traded commodity in the world. We love it, we rely on it, and we drink it in massive quantities. It is estimated that 2.25 billion cups of coffee are consumed every day worldwide. Coffee can be roasted or be made from grounded coffee. It is the preparation of coffee that is done differently. Let us have a cursory glance at some of the types of coffee based on the method of preparation. Filter coffee – Also called as Drip coffee it is prepared by using finely ground coffee placed on paper through which steaming hot water is passed and the final brew is obtained in the decoction. Plunger or cafetiere – Coarsely grounded coffee is placed in a pot over which hot water is added. 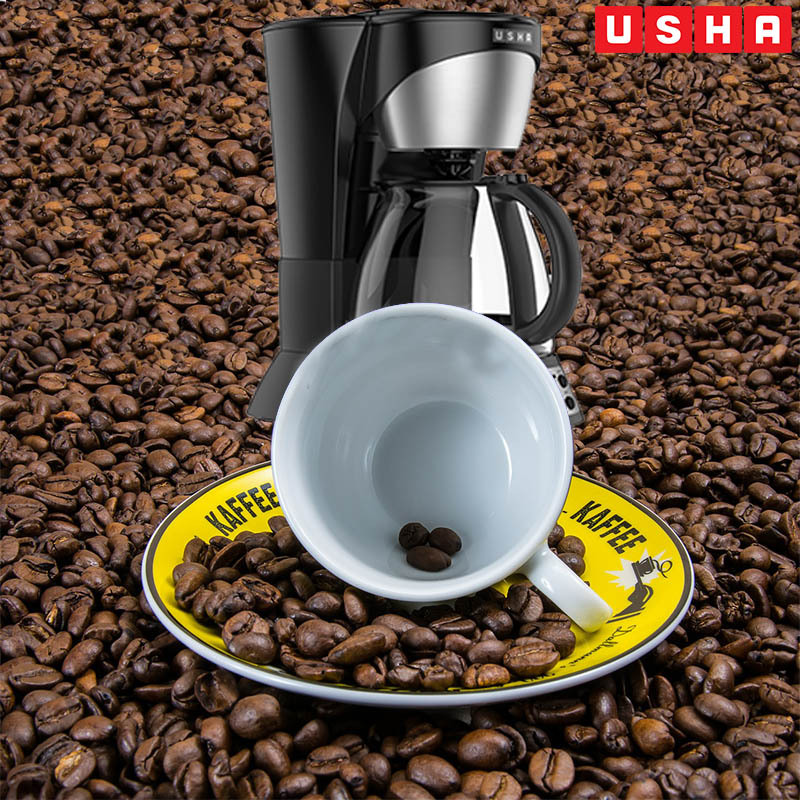 Coffee and water are brewed for some time after which the mixture is left to steep for a brief period of 4 to 5 minutes. Once done, the plunger is pushed hard to separate the coffee grounds from the coffee infusion. Espresso – The coffee ground is very fine, over which pressurized hot water is passed. The coffee obtained is filled inside the cups placed beneath the outlet. The coffee also has a layer of fine and creamy foam. Swedish/Scandinavian coffee – Made by boiling ground coffee in water, it is often served without filtering. This coffee as its namesake originated in Sweden and is consumed mostly in the Nordic countries. 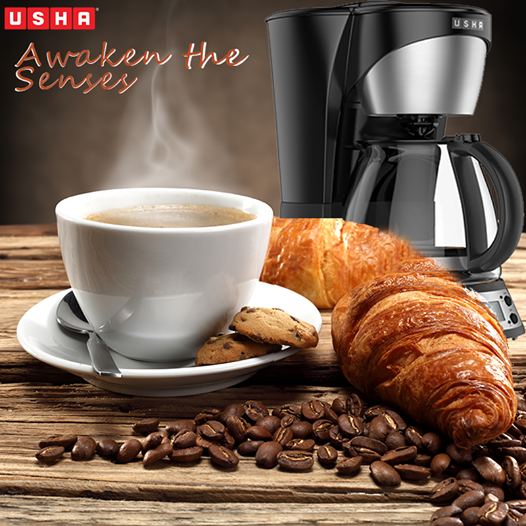 It is a strong brew of coffee and is kept hot throughout the day for consumption. Turkish coffee – This kind of coffee is prepared in a special kind of copper pot which has a long handle. This vessel is called as an Ibriq. In order to prepare a single cup of coffee in this vessel, two teaspoons of finely ground coffee and one spoon of sugar are added to one cup water. This mixture is then brought to boil on an average of three times. 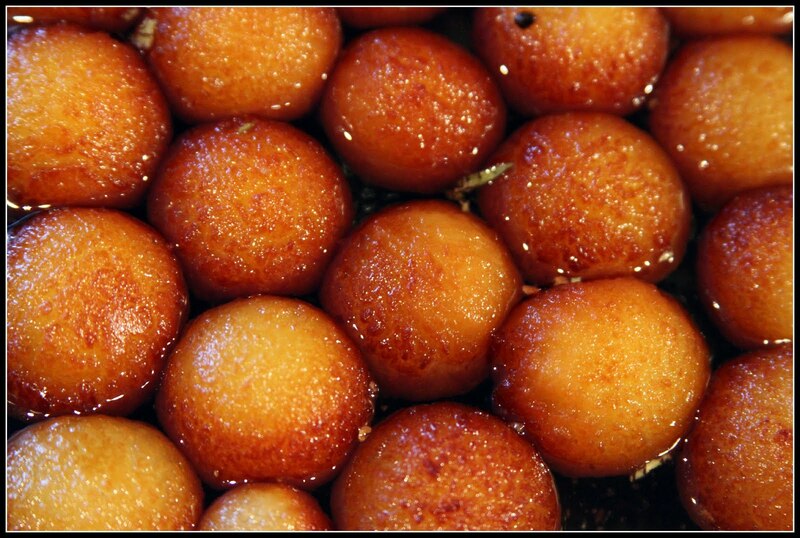 One may add cardamom seed, milk, or various syrups to enhance its flavour and aroma. A large number of people consume coffee on a regular basis. Equally vast numbers of researches have been conducted on the benefits of coffee on the health. 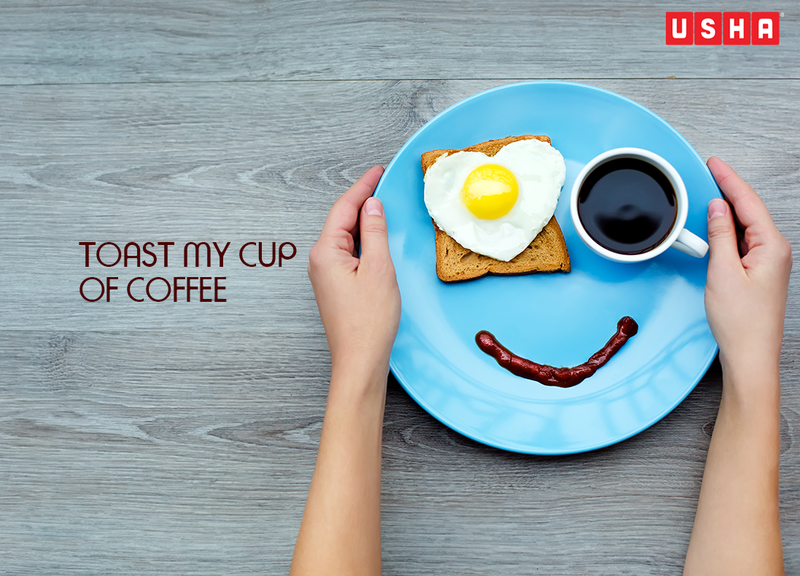 The findings indicate that a consumption of 3-5 cups everyday compliments a healthy and active lifestyle. Caffeine is one the major components of coffee. Caffeine acts as a stimulant and when taken in normal doses it helps to improve the mental fitness by making the mind more aware of its surroundings, resulting in better response time and increased concentration. Caffeine has an ergogenic effect on the body which means that it enhances the overall capacity to do physical work. It is believed that caffeine increases the adrenalin levels in the body which results in an increased blood flow to the muscles and the heart. Studies indicate that coffee consumption of up to 5 cups a day does not affect the fluid balance of the body in any way. The body therefore does not dehydrate when coffee is consumed within the normal threshold of 1- 5 cups per day. 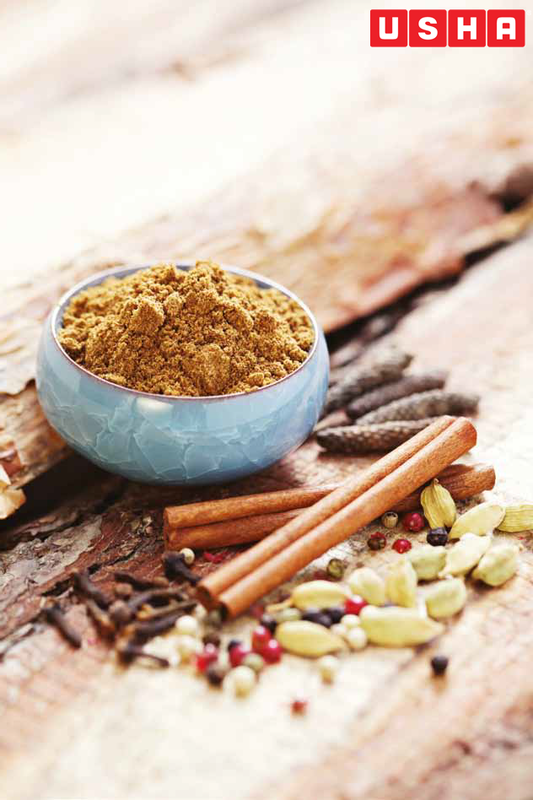 Just like Dal, different parts of India follow different methods while preparing Garam Masala. With Durga Puja just around the corner, we thought it would be apt to begin with the recipe for Bengali Garam Masala. The flavored and aromatic Bengali version can be used for marinating fish, chicken and mutton. 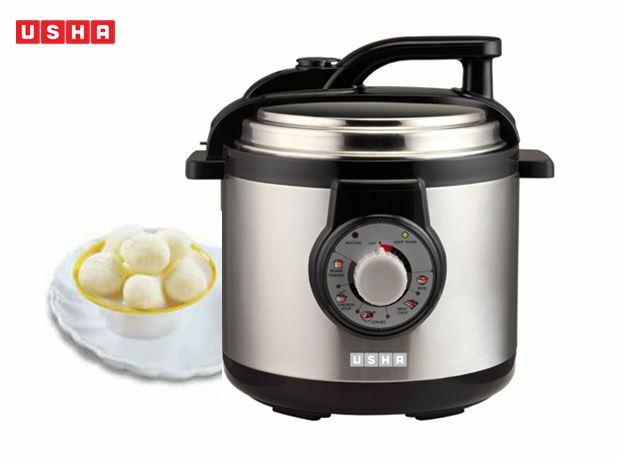 It can also be used in vegetables and curries in the end for that extra punch and aroma. Roast all ingredients in a dry pan (except ginger) over a low heat. When the spices give out their aroma, allow it to cool. Store it in air tight container in a cool dark place. To get that perfect taste and aroma remember the portion used is as important as the ingredient itself. 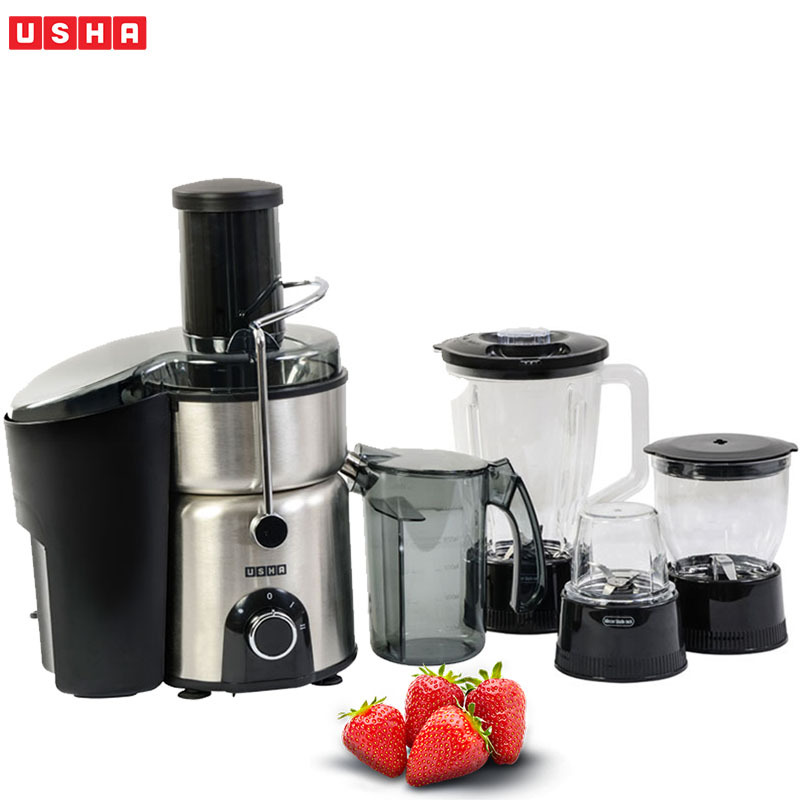 For the former closely follow the recipe at hand and as for the latter using the Usha Mixer Grinder will make your work a lot easier. 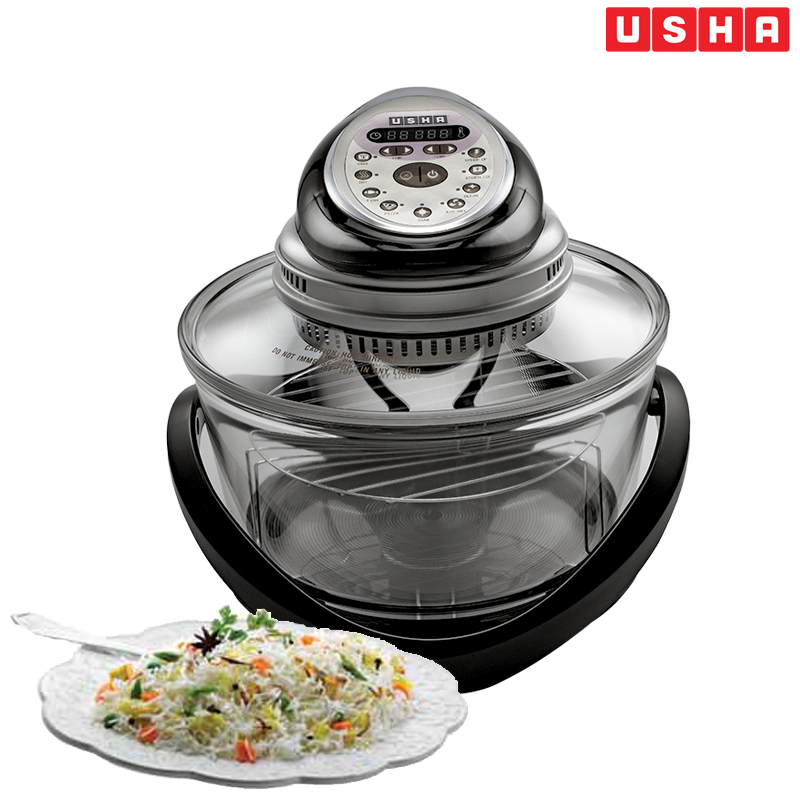 The new Usha Mixer Grinder (MG 3473) adds a revolutionary new dimension to the art of food preparation with its Vortex Pulsar Technology (VPT). VPT disperses high energy with super turbo rotations to help achieve the perfect texture, colour and aroma for your Masalas and Chutneys. 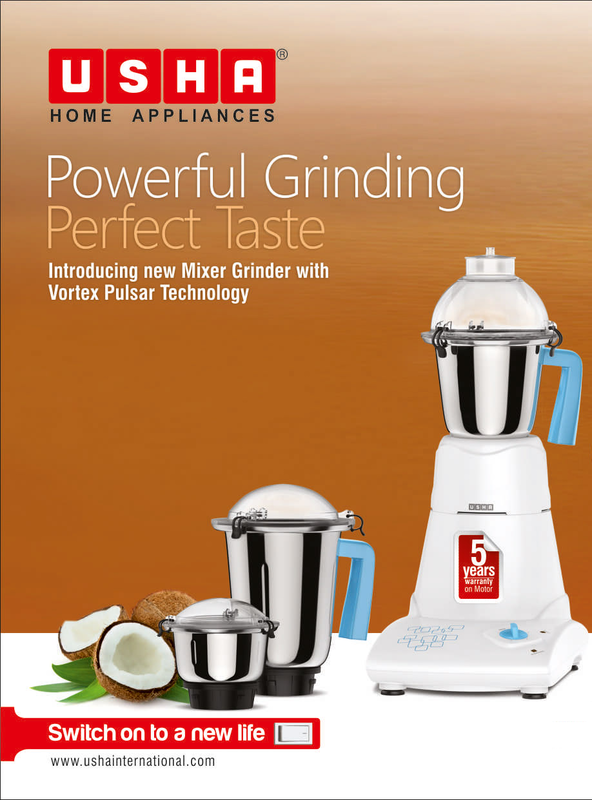 While, the Mixer Grinder’s 2 Fin Coconut Blade has been specially designed with sharp and robust blades to help you achieve the desired outcome smoothly. “Honestly, if you’re given the choice between Armageddon or tea, you don’t say ‘what kind of tea?” – Neil Gaiman. Enough has been written about this magical concoction of leaves and boiling water, and more cups have been drained with relish day after day as centuries came and went, and as they will come and go. What is it all about, one might wonder? 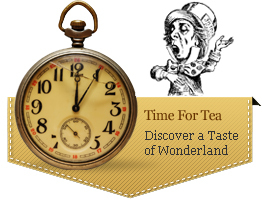 And one might wonder what will it be like to sip a cup with Mad Hatter? Lots of mad talk with method one might presume, but remember that truth does set you free in the end but first it will drive you mad. So here is Hatter over tea with a little bit of tea trivia and a little bit of outrageous tea trivia. Long before the commercial production of tea started in India in the late 1830s, tea plants were growing wild in the jungles in northeastern Assam, in India; and without o’course the factories, machines and what-not, the locals just used their hands (they still do) and bullocks (they no longer do) to create the first brews! On a different note, did you know that long long back the Assamese at times ploughed their land using Rhinos! Figure that. Darjeeling Tea is the champagne of teas! In the 1960’s two fellows Bernd Wulf and Ranabir Sen began to modify the processing of the various tea leaves in the beautiful hills that stretched below the snow-capped Himalayas. The result was the more complex aromas and oolong-like subtleties we find in many Darjeeling Teas today.However, beware for every 400 tons of tea sold under the name of the Hill Town every year, only 100 tons actually comes from Darjeeling! Tea from the southern Nilgiri hills of the blue mountains make great iced tea due to their liveliness and clarity! Besides it is really good for health: It reduces risk of heart attack and strokes, protects your bones, and bolsters your immune system too; besides bringing that smile to our faces every morning and sometimes at night too. Night? Well, here is how to have tea as a party drink: Mix gin and cold tea, flavor with little lemon rind, and you’ll get a great summer cocktail. And to keep this glorious tradition on over all the mediocrity that time tends to throw at us, add a little style to your tea drinking style, perhaps you could use a Bamboo Kettle! (an homage to China, where tea originated). Try the exquisitely designed Real Bamboo finish Kettle by Usha. It even serves 12 to 14 cups, enough to keep the conversation flowing. 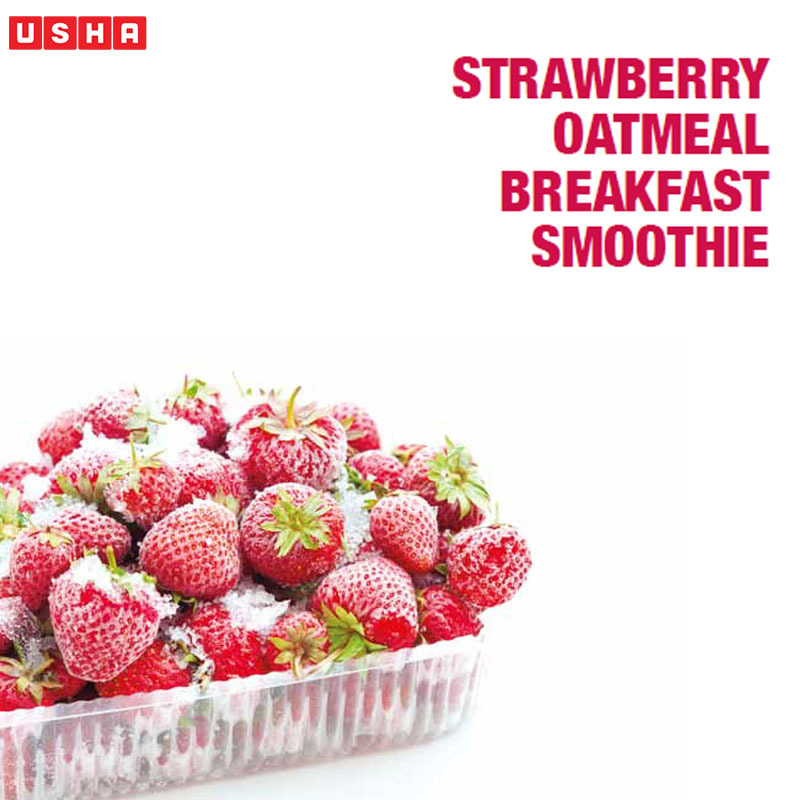 So usher in tea with Usha. Cod Fellas, Cod Father, Frydays, Frying Squad and Plaice to be, are names of a few Fish & Chips outlets in Great Britain. The British have a colourful tradition of giving quirky names to their Fish & Chips outlets. Almost considered to be their national dish, it can be traced back to the 1860’s. Before that though Brits did eat Fish and Chips they were never consumed together. The idea to pair them into a single dish was a brilliant one – and even found its way into classic English literature, the most famous being in a Tale of Two Cities by Charles Dickens. 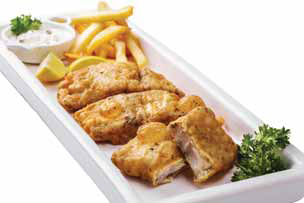 An apt course for parties, supper or a quick lunch the Fish and Chips are not as unhealthy as you think; unlike other fried dishes, an average portion of fish, chips and peas contains only 7.3% fat. Wash the fish fillet and pat dry on a kitchen towel. Marinate the fillet with salt, pepper and lemon juice. Keep aside for 10-15 minutes. Mix all ingredients of the batter to get a thick coating batter. Rest for 10-15 minutes. Spread some flour in a plate. Dredge the fish fillet in the flour thoroughly. Leave it on the flour till you are ready to serve. Dip the fish fillet in batter. 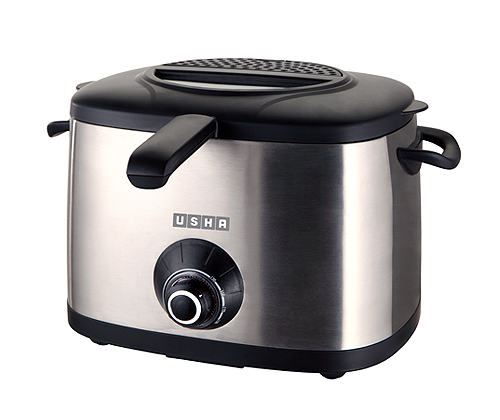 Set the Usha Deep Fryer knob at 170C and wait till the red light turn green. Deep fry fish pieces for 4 minutes till cooked through and golden. And that’s how you cook this legendary English dish. 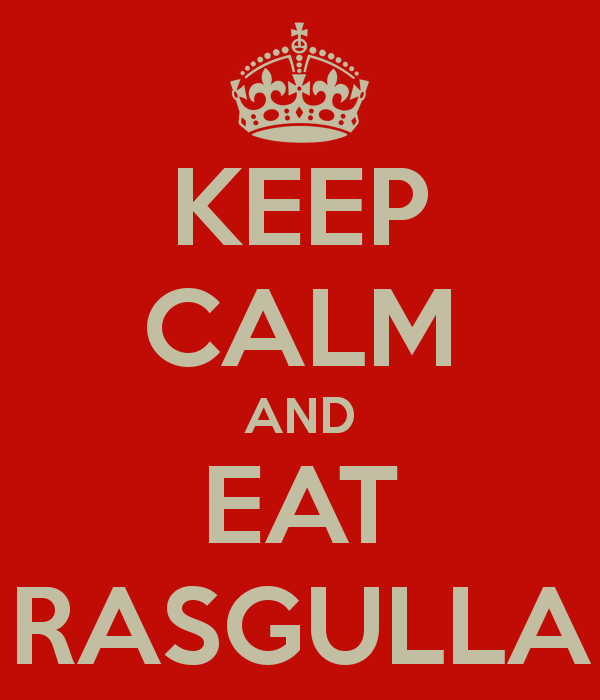 Try it as a welcome break from your Butter Chickens and Machar Jhol. A lot of people throw around names such as Bordeaux 1813, Lafitte 1916 and so on. A few of them happen to be real connoisseurs of wine , while the rest are just snobbish name-droppers – they don’t have a single clue what they are talking about. And in all of this the Non-Wine Drinker stands aloof trying to follow all that Greek; evident every time you organize a party where both drinkers and non-drinkers try their best to mingle. 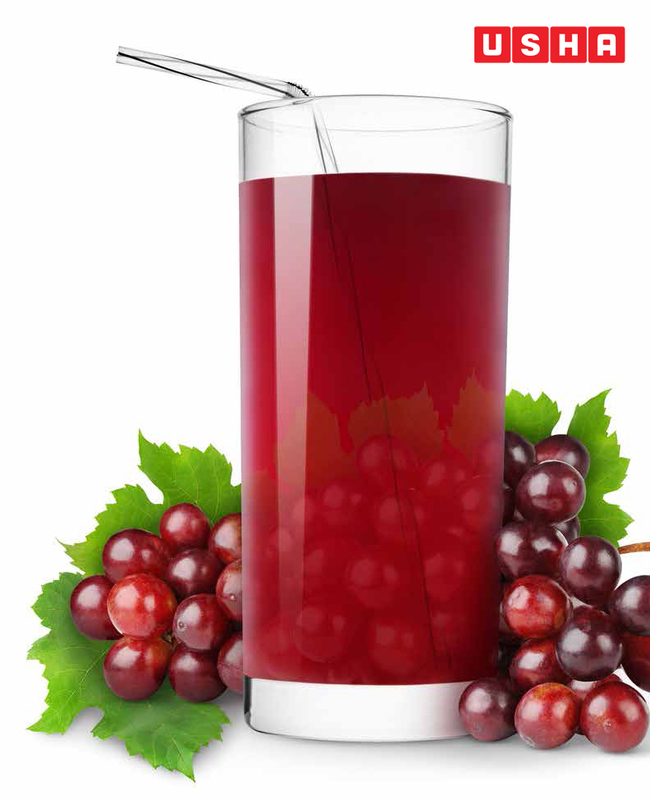 So here is an elegant drink that you can serve as a Mocktail and when asked by a nosy wine snob which year, simply answer ‘120 flat!’ as grape juice helps to lower Blood pressure and keep it in check. Besides parties, do you also need an extra kick in the nutrition department? A grape smoothie can help! Grapes can easily add a nice dose of vitamin C as well as some other much needed antioxidants that will take your smoothie up a notch.